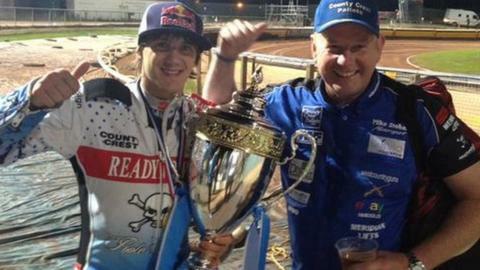 Poole Pirates became the first team for 43 years to win three successive national titles as they beat Belle Vue Aces in the Elite League Grand Final. After the first leg was drawn, Pirates secured victory with a heat to spare in Poole to win 92-90 on aggregate. Belle Vue were the last British team to win three national titles in a row. "Three titles in a row is something to be very proud of and the boys dug deep to get the win," Pirates manager Neil Middleditch told BBC Radio Solent. Middleditch dedicated the victory to Pirates rider Darcy Ward, who is continuing to recover from serious spinal injuries sustained in a crash in Poland in August. "It's 43 years since a side last won three titles in a row and 43 is Darcy's race number," he said. "Four and three together is seven, which is the number of titles we've won in total, so it was written in the stars." Following a 45-45 first-leg draw, Poole led the second leg throughout, but Belle Vue manager Mark Lemon said his team ran out of luck as they threatened a comeback in the closing heats before losing 46-44. "It was a fantastic effort by our boys, I'm so proud of them," he added. "The resilience and the way they kept on attacking and attacking, it's a real credit to them."